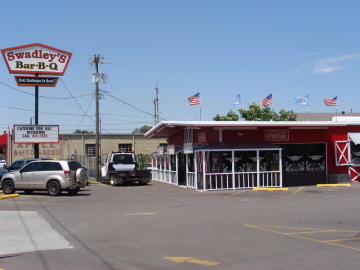 It seems that there are enough versions of barbecue in Oklahoma that one person can never try all of them, but a few restaurants have become particularly popular such as Swadley’s Bar-B-Q. With the original location in the west Oklahoma City suburb of Bethany, Swadley’s moved from NW 23rd & Council to NW 39th Expressway & Rockwell and has established several branches throughout the metro. It seems that the family’s 80 years of experience in the food industry is paying off (Swadley’s celebrated its 20 year anniversary as a restaurant in 2018). I really dislike restaurants that answer “everything” when you ask “what is especially good here?” or “what is the restaurant’s specialty?”. The employees at Swadley’s told me “ribs,” and I would agree that this is usually the best item. I have found several varieties of meat that are worthy substitutes, though, and for most occasions I think I actually like them better. 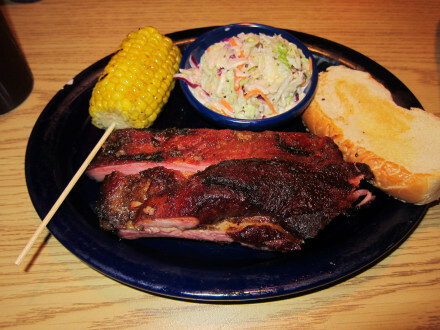 In this respect Swadley’s is among a handful of barbecue restaurants in the city that offer such a variety of good choices. In need to make a couple of comments about Swadley’s at the outset. One is that I have found the quality to be inconsistent over the time I have been coming, and this is undoubtedly what has caused many reviewers and commenters to largely dismiss the barbecue here as not being representative of Oklahoma’s best. I will say that I understand this sentiment, but I have found the quality to be much more consistent in the last couple of years (as of this writing in 2019). Some of my friends and relatives from out of town have come here and found it outstanding, as have I. It still has some weak points, but I have not found inconsistent quality to be one of them on the last several visits. Another major point is that the side dishes have always been a major factor in my desire to come here versus other choices that might be available. For a while this was inconsistent as well, although the Memorial Road restaurant seemed to keep the consistency while it was lacking at the Bethany location. Now, though, I consider this problem to be “fixed” as well, at least in my experience. No place is perfect, but it is always better to have an upward trajectory, as I believe this one has. Swadley’s menu describes the Ribs as “Hand Rubbed Honey Rib Dinners,” and I thought the flavor was one of the best I had tried. Three types of sauce were available, but before applying any of them I tried the “eating the meat plain” test to see if the flavor was worthy of standing on its own, and it passed with flying colors. I thought it had just the right amount of smoke flavor, but it seems that everyone has their own preference, so this is just my opinion. The meat left a smoky aftertaste in my mouth after the meal was finished, but did not overwhelm the other flavors while I was eating the food. The really important factor of the ribs, though, was the tenderness of the meat (and this is even more of a factor now that my teeth are no longer in the best shape). This is the one thing I most often find lacking in ribs, especially in other parts of the country (but sometimes even in Oklahoma). I would have to judge Swadley’s ribs as being just about perfect in every way, although this does not mean I could not find others (especially in Oklahoma) that are as good or better. Brisket is probably the next most popular item at Swadley’s. This meat is “24 Hour Sugar Cured” and while it is not meat that will fall apart when touched by a fork, it has the kind of barbecue flavor that would be expected in a good Oklahoma “Q” restaurant. The brisket, though, has shown the greatest variability of any item over the times I have tried it, ranging from moist to dry. This, along with the hot links, has been my biggest disappointment at Swadley’s. 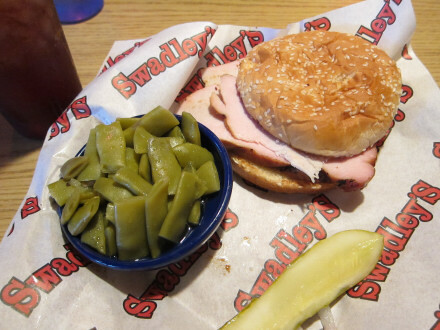 One way to try different types of meat at Swadleys’s is by ordering the “2 Meat” or “3 Meat” dinners (as shown in the photo above). One surprise for me was that Swadley’s has excellent Turkey, which I tried on one of the plates. In this case I thought Swadley’s was better than most other BBQ restaurants that serve turkey. When ordering turkey I do not like too much smoky taste, and I thought Swadley’s was just right, as well as having very good meat. 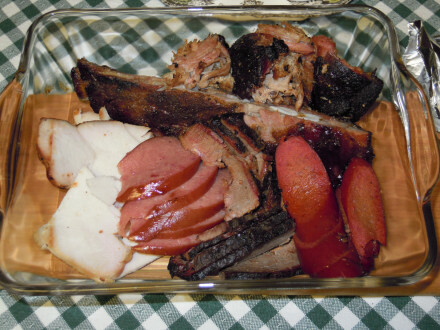 Sausage was one of the choices on the 3 Meat dinner shown in the photo (and is barely visible under the ribs). This choice was not very exciting, not because there was anything wrong with it, but because I prefer the sausage at the German and other specialty restaurants. 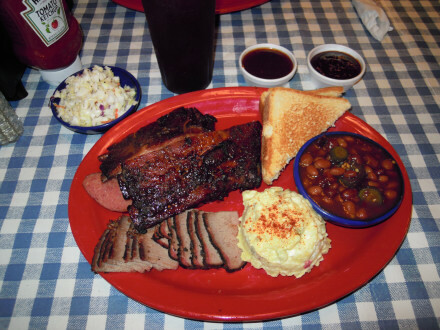 Take out orders are quite popular at Swadley’s, and one that offers a large variety of meats is the sampler plate with six items (shown in the photo above). The Pulled Pork, which I tried for the first time with this order, was cooked well with burnt ends, and I thought was excellent. The turkey was as good as it had been the first time I tried it. The Hot Links seemed too spicy to me, and I thought were not as enjoyable as the sausage. For a while I had a turkey fixation that seems to have kept me from trying the Chicken, but now the chicken is an almost constant part of any two or three meat dinner because of its excellent flavor. Pulled Pork has become another one of my “top three” choices (along with chicken and ribs), although unlike the others I think it is really only good with the sauce. I have not cared for the Sauce as much as at some other restaurants, but there are several varieties so most people can find something to their taste. I think some of the sauces are way too sweet, but the thick and juicy sauce is really pretty good. Best of all, though, is the fact that none of the sauces seem to contain MSG (and I have had enough experience with the sauces that I should know by now if they did). 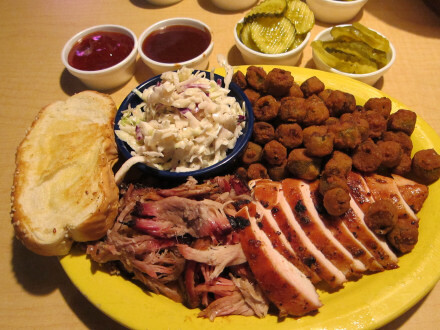 They provide several types of pickles and other condiments to make sure you have the full Oklahoma barbecue experience. Swadley’s serves an array of side dishes which makes it difficult to try them all, and I think this is another of the restaurant’s best features. Baked Beans come in two styles– sweet or hot (I was told the hot one was really hot with jalapenos included, but it was not any spicier than most Mexican food). The sweet baked beans were initially sweet for my taste, but now it has become one of my “go to” side dishes (although I really think the ones at Billy Sims are better). The Okra was extremely non-greasy compared to most versions, and I think is one of the best choices for a side dish (but it needs to be eaten right away and would not make a good take-home dish). The Green Beans seemed bland to me at first but now have become a consistent favorite of mine (and bland is good compared to the things some restaurants do to their green beans). The Potato Salad looks as if it is mostly mayonnaise, but it has a good blend of flavors that makes it better than it looks. Corn on the Cob was cooked just right, and I thought was very good. The Cole Slaw either comes with chunky pieces of cabbage and a very good dressing (this is something that I think has become more consistently good over the past ten years or so). The Iced Tea is especially good, with both sweetened and unsweetened available (at one time I saw that they used Luzianne–I do not know the current brand but it is still good). The restaurant recently switched from Texas toast to a roll on the dinner plates. I liked the Texas toast better, but the current roll is still a good feature to help round out the meal. The owner pointed out on one visit that sandwiches are popular at lunch, and this may be a way for people with a light appetite to enjoy the food here (the sampler plate and some other combination plates seem clearly designed for families rather than individuals). 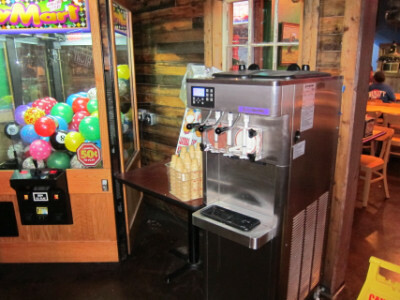 A free Ice Cream Cone machine is also available. Even though this type of ice cream from a machine is not the best, I really enjoy it as part of the tradition of eating at Swadley’s. My biggest complaint is that I always have to ask the staff which side of the machine is vanilla and which is chocolate (I like the vanilla). 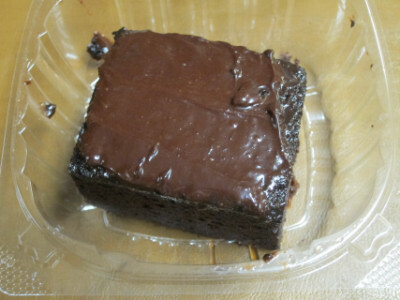 Occasionally a person may prefer one of the regular desserts, such as chocolate or strawberry cake. Out of the two I think the chocolate is a little better, although both are good choice. Overall I think I like the meals here better than the individual parts of it, simply because there is so much selection and all of it is good. I don’t have proof of this, but it also seems that the servings are larger here than at other places (for the same amount of money). This is good Oklahoma barbecue, about which I really have no complaints.